When I was in college, I used to wait tables. We had a lot of regulars in the restaurant I worked at, and when people came in who we didn’t recognize, we treated them as if they were going to come back, as if they were going to become regulars. This played out in a few different ways, but on a very basic level, we interacted with them as if we would see them again. It’s unfortunate, but true: most of us treat people differently when we assume we will never see them again, as if somehow they are less worthy of kindness and consideration if our interaction with them is only a single instance. At this restaurant, when we intentionally treated people like we would see them again, it generally resulted in customers being treated better. They received the subtle perks and privileges of a regular that bond a person with a business. Have you ever been a regular at a coffee shop? They knew your name and your drink and you probably had a warm fuzzy feeling when you walked in. It creates a sense of ownership and loyalty. It makes you not want to go to a different coffee shop, because, well, it wouldn’t be the same as entering a familiar place where people remember you and make you feel special. Maybe it’s an ego boost, maybe it’s what Mr. Rogers preached about neighbors, either way, it’s nice and it works. When I became an apartment manager, I used this same practice on the phone with prospects. I thought of that first phone call as the beginning of a long term relationship. I endeavored to treat each person who called as if I was setting the tone for how we would interact for the next year or more. As if in that two minutes, I was showing them how they would be treated if they became a resident. I don’t have the specific stats, but trust me — closing rates and occupancy levels were consistently high. 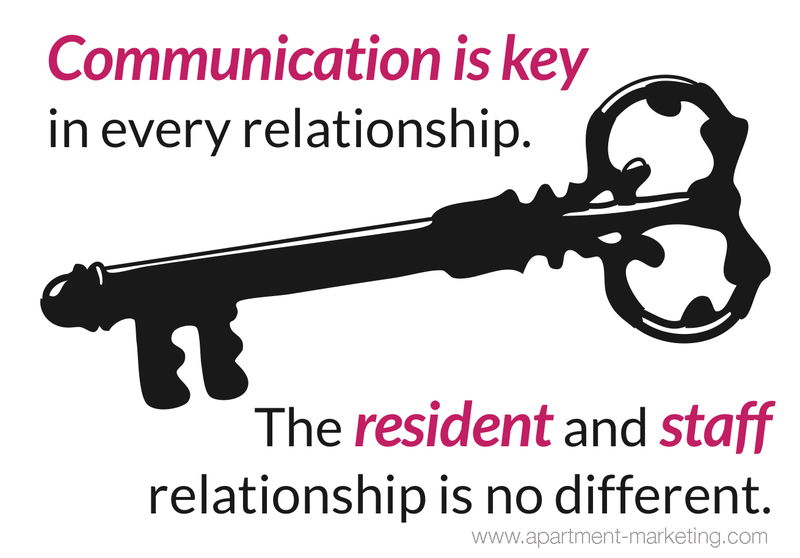 There are many ways in which the relationship between staff and residents is like a long-term romantic relationship. If you really want to take it a step further, you could compare Craigslist to on-line dating… but, I’m no stand-up comedian, so we’ll just move on. 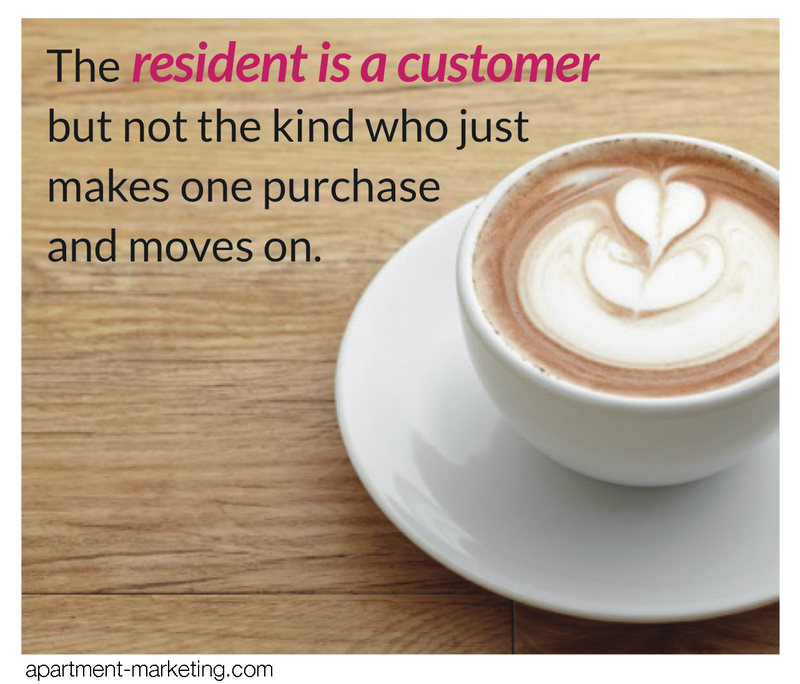 The resident is a customer, but not the kind that just makes one purchase and moves on. In a sense, every single interaction you have with them is a part of the sales process. The selling doesn’t end when a prospect signs a lease. You want them to refer their friends, give positive on-line reviews, and of course renew that lease. That means you need to maintain the relationship after the commitment is made, i.e. : after the lease is signed. Just like a married couple still needs to go out on dates after the wedding, you’ve got to continue courting your residents… to keep the spark alive, if you will. Resident events are like a date night. Quickly taking care of maintenance requests (or at the least communicating about delays) is like a spouse’s “Honey-Do” list. Sometimes all a resident needs is some clear communication, to be reassured that their issue is not being ignored, that the office knows and is working on it, even if it’s going to take longer than would be ideal. Communication is key in every relationship. The resident and staff relationship is no different. You can create that sense of loyalty and trust with some small attitude shifts and a little extra effort to communicate. Answer the phone and lead the tour like you are building a relationship with this person that will last for the next year…or more.